So… for those who like The Legal Genealogist have ancestors who passed through Oklahoma, it turns out there’s a way for us to own a little piece of Oklahoma. A piece that we can absolutely use, in a reel way, for our own research. And no, actually, that isn’t a typo. You really can own a reel… or a digitized version of it, your choice. I was out in Oklahoma City this past weekend for the spring seminar of the Oklahoma Genealogical Society. Great group of people and I can only hope the attendees had half as much fun as I had. It was held in the absolutely gorgeous meeting room of the Oklahoma History Center, the combination museum and research library of the Oklahoma Historical Society. And I had the great good fortune on Friday to have a tour of the collections of the Oklahoma History Center, guided by Laura Martin, Deputy Director of Research. There aren’t enough words to describe the joy anybody with Oklahoma roots will experience in that facility. The sheer scope of the records dating well before statehood and continuing up to today is stunning. From some of the very earliest extant records on the Indian tribes of Oklahoma (there are school records going back into the 1840s) to court and probate records to oral histories to a photographic collection covering just about every aspect of life in Oklahoma, the holdings are a researcher’s dream. But then there are the newspapers. The Oklahoma Historical Society has served as the centralized repository for records dealing with the history of Oklahoma since before statehood. OHS has the largest collection of Oklahoma newspaper titles on microfilm. Titles date from 1819 to the present. That last sentence breaks your heart, doesn’t it? It’s all there… but you can’t get to it if you can’t get to Oklahoma City. First off, the Oklahoma History Center has digitized hundreds and hundreds of newspapers and, through its Gateway to Oklahoma History, has put hundreds of thousands of newspaper pages online. 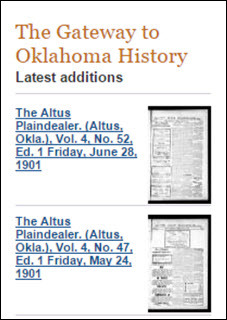 From the Altus Times-Democrat (1,193 files from 1903 to 1921) to the Yukon Sun (596 files from 1905 to 1922), what you need for your family history may already be online. Second, if all you need is a single article from a single newspaper — say, an obituary — the Oklahoma History Center will retrieve it for you for a fee of $10 (you have to have the exact date — the research fee covers one search of one day of one newspaper). You can get more information through the Research Requests/Genealogy Orders & Fees page. And between those two possibilities, you may just find what you’re looking for. What if what you really need is, say, the not-yet-digitized Frederick (OK) Free Press for the year 1903? Or the Frederick Weekly Enterprise of 1911-1914 (just to name two newspapers where I hope to find evidence of my own Oklahoma family members)? What if you want to be able to read every copy of those newspapers during those years? You can buy that reel of microfilm. Any reel of microfilm can be duplicated for a fee of $75, plus $5 shipping, through the Microfilm Orders page. And for a little bit more — roughly $100 — the Oklahoma History Center will digitize it for you… and, if the original films are good enough, they’ll even make the digitized files word-searchable. Now trust me — I get it — $100 isn’t exactly chump change and there may be four or five or six reels of microfilm that you really want. But think about it for a minute. What would the airfare cost? Car rental? Meals? A single night in a motel on the outskirts of Oklahoma City — you don’t even want to think about the rates in the brand-new downtown hotels — will set you back the same thing as one of these. It’s not as good as being there. Trust me on that. I’m already trying to figure out how to clear a week from my schedule to get back there, plant myself at one of the microfilm readers, and immerse myself in my family’s history. But if life gets in the way, as it so often does, isn’t it nice to have options? I have visited the Oklahoma History Center, and it’s wonderful. However, anytime I see the words “Oklahoma” and “genealogy” together, all I think of is the death certificate that I so badly need for my research–but can’t get–due to a law passed in Oklahoma several years ago. Any news on when that situation might be addressed by the legislature?